Office hours means some nice cup of coffee and a plate of calorific snacks during breaks with co-workers or visiting the nearby Dhaba to have some sumptuous meal laden with a high amount of cholesterol. The time went through associating with work partners regularly and the calorie-loaded candy machine snacks, heated products in the lounge and fast food snacks at regular intervals and thus getting you a habit of having unhealthy weight pick up. So it is very much likely that a person can gain too much of weight through workplace itself. We have seen many reality shows or any general show to lose weight regimes. in a way, such a competition is usually organized at an extremely professional level. 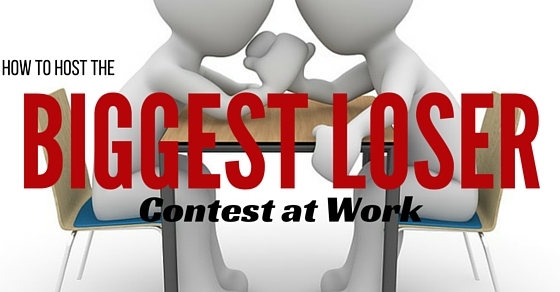 The biggest loser contest would like all the co-workers to participate in weight loss competition challenge and the person or group with highest loss will be awarded with some kind of trophy or cash amount. It has two benefits of its own. First one is you get paid or receive awards if you win and secondly you can go ahead losing your weight improving your health. These contests can be executed effectively if properly planned out and executes in a proper order. For that, we need to go through some steps to ensure flawless contest conductance. It is always the best to start these types of contests during late winter or late spring. January and April are the best months to begin a test. Usually, in January people go for some new year resolutions. And losing weight is the highest sort after New Year resolution ever made by people. So this weight loss contest can help people maintain their resolution too. Also, spring is the season where nature is found in its best appearance. Moreover, the climate of spring is moderate, ideal for this type of contest to take place effectively. After planning for the biggest loser contest, you need to gather as much of information about this as possible. You need to do a bit of online or offline research or surveys to gather weight loss competition ideas and possible prizes and how to formulate the plan without much hindrance. Only through the proper knowledge, you can go forward planning out the detailed contest with ease. Add a declaration to your working environment pamphlet. Post flyers and pamphlets in various departments of the organization, such as in the exercise center or lunch area or in the cafe, where the population is likely to visit. Send bunch messages giving individuals the chance to agree to the test. You can create your own Facebook page or group for the occasion. And add as many employees as possible. You can keep a certain amount as .Utilize the charges that you gather, to buy week by week, month to month, or end-of-challenge prizes. On the other hand, you can pool the money and present a money prize to the champ of the challenge altogether or you can give a certain incentive to the winner. The prize money can be in any form you want. You need to keep tab of certain rules that you will be making for the contest. Make proper easy to follow rules so that contestants will be eager to take part as well as some other workers who don’t show much of enthusiasm will also start to show some kind of interest in this contest. Also, you need to keep certain criteria too for the contest so that people who are underweight won’t have to take part in such a contest. Think of some interesting rules and criteria. After setting up all the necessary rules and criteria, you need to set a particular date to commence the contest and also a date by which the contest shall end. Whether individuals want to get in shape or they will take an interest in groups, they need to enroll before the commencement of contest and be present by the end of the contest. You need to keep certain prize amount to lure contestants to participate in this competition. The prize amount can be redeemed as monthly extra benefits or direct cash amount. Whatever the amount may be, it should certainly be more than enrollment fees at the same time should be able to lure participants to tzake part in the competition without a problem. How weight reduction will be scored will depend on how you are going to prepare for the contest. Scoring mainly takes into account the rate of loss of body weight to the total weight of the person in general or sometimes, people prefer inches of size reduction for their contest. So prefer good scoring system such as weekly scoring out of 100 or monthly. Set up weekly measuring plans and sort out week after week bolster exercises. You will offer enthusiastic backing to each other and in addition showing each other new weight reduction techniques. Use respites or lunch hours to get with members. Talk about what has and hasn’t worked amid your weight reduction ventures. Prepare for some fun events like running race or some kind of interesting programme to keep the enthusiasm factor going on. Join to walk or to work out for the contest or work out an arrangement with a nearby wellness office to set up gathering exercise programs and to give educators and fitness coaches. For this, you can go to well-being organizations such as gym or fitness centers or projects to gather tips for this contest. At the end of the contest, you can do some of these to ensure the competitive spirit keep going. Make a trophy for the victor or for the triumphant group. Present them with the best sort of felicitation possible. Give away a money prize or a blissful trip to any merchandise store for no or little cost. Giveaway little things of wellness such as fitness equipment like treadmills or dumbbells. Free authentic fitness sessions with a well-known coach can be an option too. The biggest loser contest has been taken everyone into a new height of weight losing regime. Many companies are now trying to implement this scheme to make their workers more fit in the least number of days possible. Whether it is played in individual format or as a team, this will certainly ensure everyone to lose a substantial amount of unhealthy weight and give a new boost to their lifestyle. As we have discussed earlier, you can stick your posters or you can even do recommendation style of advertising. Whatever works, make sure to create an awareness about the competition among your colleagues. Of course, you need it in general. This will act as bait for your fellow participants and will keep them motivated for the game. Instead of stretching the competition to a year make it a compact format like within 4 to 8 weeks. This will keep the competitors motivated. This is a simple means of calculating the loss in fat and it gives justice to every individual regardless of their weight and targeted loses. Whether you want to conduct the competition as a team or individual it is very vital as many changes approach the competitors. In an individual setting the people will be responsible for their own weight but in a teamwork, each member will be responsible for the whole team for winning or losing this competition. Although the person will be taking part in the weight lose competition, it is not necessary that he will be happy to share his weight stats publicly. Therefore, it is important to maintain everyone’s privacy. To begin the competition, you need to select a team leader, in the case of team competition, or you can select a common leader in case of individual competition. The leader will be responsible for measuring weights every week and making sure that all the calculation are done properly. A particular day of the week will be selected for measuring everyone’s weight. You can use Friday for such purpose as it is an ideal day for such activities. The weight will be checked by the team leader in case of team competition or by a common leader in case of an individual. Select a place which is not crowded with people as it provides a proper surrounding for discussing your competition and maintaining privacy about data. At the end of the competition, the leader will calculate the total percentage of losing in individual competition or team’s total percentage loss in the team competition. Whichever will have higher percentage will win this competition. Although you can easily hold a competition by following any of this rules but you need proper format and records to maintain for the effective conductance of the contest. The format includes various tools and charts that need to be kept in maintenance for efficient performance. One of the most common forms of format is a weight chart. It should include your weight from the starting of the contest to the ending. Not only weight but also the size can be taken into consideration for this kind of chart. It should hold a weekly record of your weight and size properly measured which shall go for evaluation at the end of the contest. Only through these charts, that a winner can be determined. The most basic tool for the contest is a BMI calculator. It is just the measure of body fat with respect to height and weight. This is an effective tool used on biggest loser contest. The Proper advertisement is necessary as we all know. So, therefore, preparing good attractive brochures and pamphlets is mandatory to induce enthusiasm. The flyer should not be too shiny or flashy, instead, it should look classic as well as attractive at the same time. A place with 2 to 3 colors at max and give way to the best flyer for your contest. This kind of competitions can not only enhance your health but also can improve your lifestyle in many ways. The challenges that you would normally tackle is of many kinds. Individual taking into account weight reduction and bunches with an aspiration of weight reduction, or both of these are compensated with inches lost around the abdomen if not the prize money. You have to discover which of these, your organization is going to utilize and how the estimations will be taken. The time allotment is usually one month, six weeks, two months or more.